In May 2018, my case note was published in Jurisprudentie Vreemdelingenrecht, a Dutch journal that publishes on asylum and refugee law. A couple of weeks ago, I received an invitation of Mr. G.E.W. Westendorp of the Foundation Migration Law Netherlands (Stichting Migratierecht Nederland) to write a case note on the recent views expressed by the Committee on the Rights of the Child pursuant to an individual complaint. It was the very first time that the Committee expressed its views in light of the individual complaints mechanism. The case concerns a Somali woman who fears that her daughter – born in Denmark – will be subjected to Female Genital Mutilation/Cutting (FGM/C), if she is to be deported to Somalia. The mother has submitted an individual complaint to the Committee on behalf of her newborn daughter and claims that the expulsion of her daughter would be in violation of the Convention on the Rights of the Child (CRC). The mother claims that the principle of non-refoulement applies to the CRC. The Committee follows this reasoning and is of the opinion that there is a violation of Articles 3 and 19 of the CRC. In my case note, I focus on the role of the mother and her ability to resist social and family pressure to prevent her daughter from undergoing FGM/C in Somalia. After discussing the complaints procedure before the Committee, I analyze the arguments of both the mother and of the State of Denmark. Afterwards, I discuss the substantive arguments of the Committee. I also compare the views of the CRC Committee with the views of other Committees in similar cases. Lastly, I briefly discuss how Dutch judges have dealt with similar cases. My case note can be accessed here (if you have a subscription to Migratieweb). I would like to thank Mr. G.E.W. 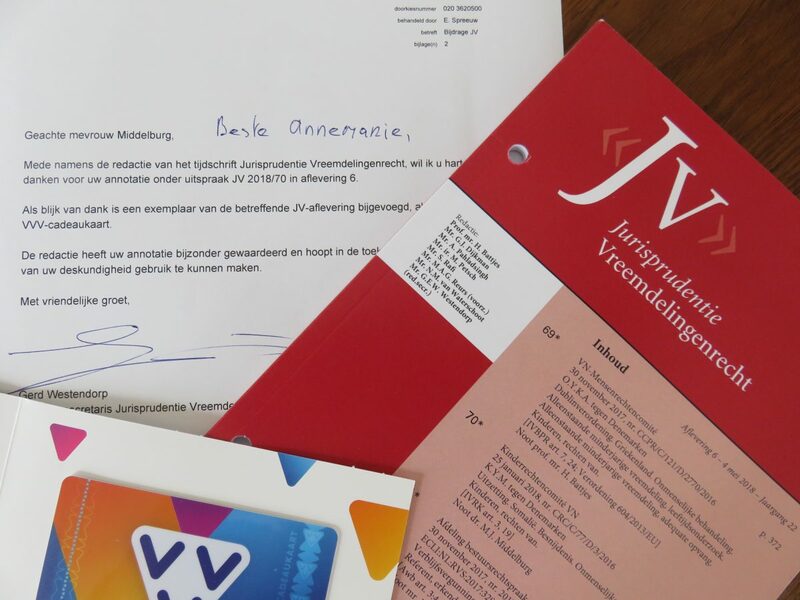 Westendorp of the Foundation Migration Law Netherlands for the kind invitation, our great collaboration and I look forward to work together in the future! M.J. Middelburg, Case Note, UN Committee on the Rights of the Child (CRC), I.A.M. (on behalf of K.Y.M.) v Denmark, communication No. 3/2016, CRC/C/77/D/3/2016, 25 January 2018, Jurisprudentie Vreemdelingenrecht, 2018/70, ve18000247, May 2018. Please click here for my other publications.